By the mid 1990s, the landmark DCCT trial has established the paradigm of glucotoxicity, in type 1 but not in type 2 diabetes. Still euphoric from the trial’s success, it seemed only a matter of time before tight blood glucose control was proven beneficial in type 2 diabetes as well. Nobody stopped to consider exactly how giving insulin to hyperinsulinemic patients was going to help. Nobody paused to consider that insulin toxicity might outweigh glucotoxicity. So, borrowing heavily from the type 1 diabetes playbook, the use of insulin is increasingly used for type 2 diabetes as well. Over the last decade, the number of patients using insulin rose 50% as almost 1/3 of diabetic patients in the United States use some form of insulin overall. This is slightly horrifying, considering that 90-95% of diabetes in the United States is T2D, where the use of insulin is highly questionable. In particular, the priority was to reduce cardiovascular disease. While type 2 diabetes is associated with numerous complications including nerve, kidney and eye damage, the morbidity and mortality associated with cardiovascular diseases dwarfed those by an order of magnitude. Simply put, most diabetic patients died of cardiovascular disease. The United Kingdom Prospective Diabetes study, known as the UKPDS, was going to be the study that would prove the benefits of intensive blood glucose control. Almost 4000 newly diagnosed type 2 diabetic patients were randomly assigned to two groups. One would follow conventional treatments and targets and the other group would receive intensive group with sulfonlyureas, metformin or insulin. Sulphonylureas (SUs), have been in widespread use for the treatment of type 2 diabetes since 1946. They lower blood glucose by stimulating the body’s own production of insulin from the pancreas. Since type 1 diabetics have lost their ability to produce insulin, these medications are not appropriate. The other widely used medication is metformin. Its use in the United States was temporarily halted due to concerns of side effects, but has been used extensively in Europe and Canada for fifty years. Metformin does not stimulating insulin, but instead blocks gluconeogenesis. This lowers the risk of hypoglycemia and weight gain because it does not increase insulin. In the UKPDS study, the intensive treatment group targeted a fasting glucose of less than 6.0 mmol/L and successfully lowered the average A1C from 7.9% to 7.0%. But there was a price to be paid. Higher dosages of medication resulted in more weight gain, by an average of 2.9 kg (6.4 pounds). In particular, the insulin group gained the most weight, averaging 4 kg (8.8 pounds). Hypoglycemic reactions significantly increased, too. These side effects were expected, though. The question was whether the benefits would justify the side effects. Published in 1998 the results were absolutely stunning. Intensive treatment produced almost no benefits. Expecting a slam-dunk like the DCCT trial, there was instead only some minor benefit in reducing eye disease. Glucotoxicity was the prevailing paradigm of treatment. But despite ten years of tight blood glucose control, there were no cardiovascular benefits. The discrepancy was shocking, but the story would get stranger still. Metformin was considered separately from insulin and SUs in sub study UKDPS 34. Overweight type 2 diabetic patients were randomly assigned to either metformin or diet control. Metformin lowered the A1C from 8.0% to 7.4%. This was good, but not as good as the results with the more powerful insulin and SU medications. 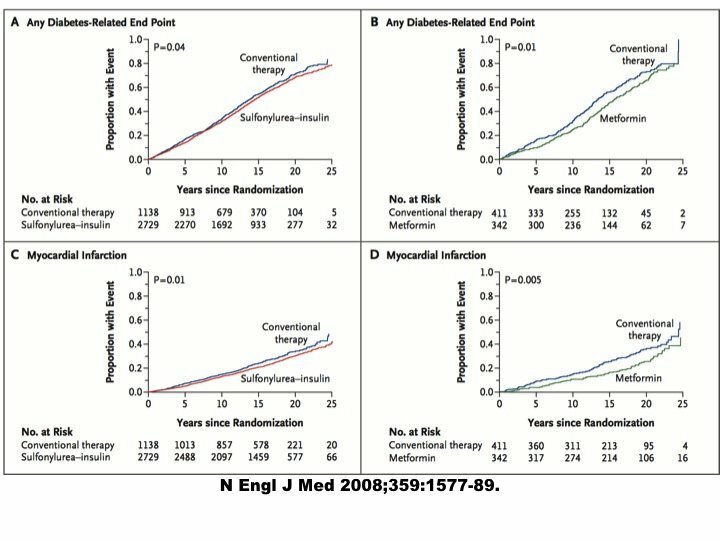 Metformin reduced diabetes-related death by a jaw-dropping 42% decrease and the risk of heart attack by a whopping 39%. Metformin performed far superior to the insulin/ SU group despite the weaker blood glucose effect. Something was protecting the organs, but it had nothing to do with the blood glucose lowering effect. The specific type of diabetic medication used made a huge difference. Metformin could save lives, where SUs and insulin could not. The glucotoxicity paradigm, proven in type 1 diabetes, had just failed miserably in type 2. Blood glucose was not the only player or even a major one. The most obvious concern was the well-known propensity of both SU and insulin to cause weight gain in patients that were already obese, which could lead to cardiovascular problems down the line. Metformin, which does not raise insulin, does not cause obesity and this certainly could have been the crucial difference. Published peer-reviewed commentary from 1999 reveals that concern was percolating about the real issue, exacerbating hyperinsulinemia in a patient with too much insulin already. Dr. Donnelly from the University of Nottinghmam, UK writes, “The findings could also be interpreted as indicating that insulin and sulphonylureas are equally harmful in the obese, possibly as a consequence of hyperinsulinaemia”. This is not so difficult to understand. Intuitively, everybody understood that type 2 diabetes was closely linked to obesity. Drugs that would worsen the obesity are likely to worsen the diabetes, no matter what happens to the blood glucose. Extended follow up of the original UKPDS study allowed detection of some cardiovascular benefits but relatively mild and much smaller than expected. Death rate was reduced by 13% in the insulin/SU group compared to a far more substantial 36% in the metformin group. The paradigm of glucotoxicity was established for type 2 diabetes, but only barely. Blood glucose lowering medications had marginal benefits that required twenty years of follow up to become apparent. Unanswered questions remained about the differences between types of medications, particularly between those that raised insulin versus those that did not. As the obesity epidemic gained strength, type 2 diabetes relentlessly followed. For the large pharmaceutical companies, this meant only one thing – more potential customers and more potential profit. For many decades, the only available medications for type 2 diabetes were metformin, SUs and insulin. By the early 1990s, it had been eighty years since the development of insulin and fifty years since the introduction of the SUs. Metformin had been first used in the 1930s. Resources poured into the development of new classes of drugs. By 1999, the first of these new drugs was ready for the primetime. Rosiglitazone and pioglitazone belonged to a class of drugs called thiazolidinediones (TZDs), which bound to the PPAR receptor in the adipocyte to amplify insulin’s effect. These drugs did not raise insulin levels but instead magnified insulin’s effects, both good and bad. This lowered blood glucose, but the also had other predictable adverse effects. The biggest problem was the weight gain. Over the first six months, patients could reliably expect to gain three to four kg (6.6 – 8.8 pounds) of fat. Insulin encourages salt and water retention, leading to predictable side effects. Fluid retention typically manifested as swollen ankles, but sometimes progressed to frank heart failure – fluid accumulation in the lungs causing shortness of breath. Nevertheless, these were known effects and the benefits were felt to outweigh the risks. The TZDs were released in 1999, and backed by multi million dollar promotion budgets, quickly became best sellers. They were the Harry Potter of the diabetes world. With almost unprecedented acceptance in the diabetes community, sales zoomed from zero to $2.6 billion in 2006. The wheels started to fly off in 2007 with the publication of a meta-analysis in the influential New England Journal of Medicine. Unexpectedly, rosiglitazone increased the risk of heart attacks. The Federal Drug Administration (FDA) in the United States convened an advisory board in 2007 and similar deliberations were held in Europe. Twenty-four independent experts reviewed the available data and concluded that rosiglitazone indeed increased the risk. There were also significant concerns about data tampering in the RECORD study, one of the largest trials that had ‘proved’ its safety. Subsequent FDA investigation proved that this concern was well placed. Rosiglitazone use was associated with a 25% higher risk of heart attack. Pioglitazone had its own troubles after being associated with a higher risk of bladder cancer. 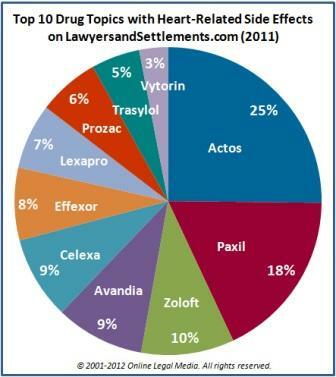 By 2011, Europe, the UK, India, New Zealand and South Africa had all banned the use of rosiglitazone, although the FDA continued to allow its sales in the United States. However, the glow had faded. Sales shriveled. In 2012, sales had fallen to a paltry $9.5 million. The debacle left some beneficial policy changes in its wake. All diabetes medications henceforth were required to conduct large-scale safety trials to safeguard the public interest. Dr. Clifford Rosen, the chairperson of that FDA committee identified the key problem. New diabetic drugs were approved based solely on their ability to lower blood glucose, under the unproven assumption that this would reduce cardiovascular burden. However, evidence to date, including the UKPDS and the smaller University Group Diabetes Program had failed to confirm these theorized benefits. The Cochrane group, a well-respected independent group of physicians and researchers, estimated that glucose control was only responsible for a miniscule 5-15% of the risk of cardiovascular disease. Glucotoxicity was not the major player. It was barely even in the game. What followed, unfortunately confirmed Dr. Rosen’s misgivings. Published in 1998 the results were absolutely stunning. Intensive treatment produced almost benefits. Thank you for the great information. What is the title of Cochrane review (5-15%), I am trying to find it? What an eye opener. Thank you Dr Fung. According to Dr. Kraft’s extensive research, by the time t2 diabetes is diagnosed, the insulin resistance is so high and thus also the insulin response. Meaning there is a LOT of insulin in the system and it stays around for a long time. So Dr. Fung I’m trying to understand why you believe the exogenous insulin –which probably is a fraction of what the body is already producing — makes such a dramatic health, weight, etc difference. Thanks for explaining. The body does not really produce much insulin; even in hyperinsulinemic states, the pancreas only produces a tiny amount and sends it directly to the liver. The insulin shot goes under the skin, which turns the body into an insulin pump. In order to have enough insulin hitting the liver, what is injected is a mega dose, compared to the insulin that the body produces. Hi Jerome, thanks for sharing the link. I read through the material on the link between insufficient ascorbate acid and diabetes. Did you start taking the 1g supplement because you were pre-diabetic? What brand of supplement do you recommend and how long have you been using it? I am pre-diabetic and have been on low carb diet for two years, but I think I need to do more because my HA1C levels are in he low to mid 7’s. Hi Sten, thanks for sharing. You mention fasting to help clean out the fatty liver and pancreas… What kind of fasting Do you recommend? I should add – I was referring to hyperglycemia in diabetics. Oh – some studies exist suggesting that Metformin can aid weight loss due to suppression of hunger. This is not reported in everyone. However, the point being made is it not due to Insulin or an enhanced state of lipolysis which they are certainly in as the insulin theory of obesity would have us believe. Then how would you explain the unmedicated insulin resistant T2 diabetic/pre diabetic who goes on a LC or IF diet and reduces his morning glucose from 126 to 86 and his A1C to under 6? Thanks for that Sean. It makes sense from the perspective if the insulin’s role was to open the cells to accept glucose and, in the diabetic or someone with insulin resistance, that was not happening, the cell would die, would it not? If heart or brain cells started to die, that would have a pretty dire consequence to the body, would it not? I remember from reading Petro Dobromylskyj’s block that insulin’s most important job is to lock fat in fat cells so body must use excess (toxic) glucose first. If insulin is high all the time, you can’t loose weight from fat cells. I believe that resistance to accept insulin’s share to obesity comes to fact that then you must admit that refined carbs like sugar and flour are the reason for obesity and then whole agriculture industry must be changed. Too many has too much to loose. JR62 – Insulins most important job is certainly NOT to lock fat into cells – that way of thinking is used to frame insulin as the cause of fatness when this is just not the case. Insulin dose not stop you losing weight, glucose is not toxic and refined carbohydrates’ are not the cause of the obesity crisis. Overconsumption of such foods is closer to the answer than blaming isolated foods or macronutrient’s. I was even only pre-diabetic and it worked wonders for me. The high morning blood sugar went completely for me when followed up with Intermittent Fasting, IF. He probably would love to answer these questions but he’s a busy guy and can only carve out enough time to get the post put up. I’ve noticed that he sometimes does reply though. I think it’s just a matter of him having enough time. Nomi, yes, I am sure he is busy but, more importantly, he legally can not give out what could be construed as medical advice to ‘patients’ he isn’t treating. I have not seen him reply in years, and even back then only rarely. I wonder if you’ve had a chance to see the new documentary out on Netflix called What the Health – it claims that meat is the main driver of diabetes…I’d love to hear your opinion on this documentary when you have a chance. I’ve heard a lot of my friends talking about it, and I think it’s total misinformation! I’d love to hear what he has to say too. I’ve seen that documentary and as everyone knows you can get pretty much any study to highlight your agenda with the right word judo but I find it amazing that there are so many professionals that counter the LCHF and IF plan. I’ve personally lost 30 lbs and got my doc to take me off of Losartan for hyper tension by following this plan, so I know it works. A buddy of mine has lost 70 lbs following this plan. It’s a pro-vegan propaganda piece. They want to get him on insulin so they can feel done good and important job. Advice someone to change diet is not like doing “important” job as patient himself has that essential part to do. Need your advice on the effectiveness of IF/Fasting on chronic kidney disease? My dad has a substantial proteinuria – attributed to hypertension and possibly pre-diabetes. Right now he’s under several medications, not sure if this condition is reversible. My question is: Once someone has their diabetes under control with low carb/high fat diet and intermittent fasting, they have no signs of kidney damage, eye damage, but do have neuropathy that they can tell is improving, do they need to continue taking a preventive drug (losartan) to prevent kidney or eye damage ? Doctor wants to continue the drugs to prevent diabetic damage to kidneys and eyes yet for over a year a1c has been 5.5. Once controlled like this, will organ damage occur anyway?